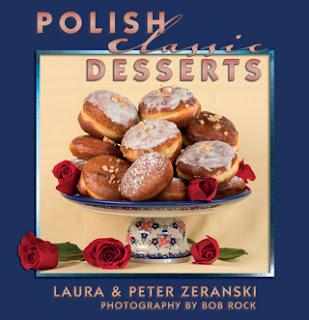 Laura and Peter recently recorded a conversation about growing up with Polish holiday traditions, for Polcast – an excellent podcast on a wide variety of Polish issues, which you can hear at: www.mypolcast.com -Episode 59, available now. We’d like to share with you a transcript of that conversation. Everything in red are Laura’s comments and everything in black are Peter’s words. (Laura): So unless you’re living totally in a jungle somewhere, you know that shopping malls and most stores have already been decorated for Christmas for a very long time – even starting before Halloween. (Peter): When we were growing up, Christmas was never this huge commercial spectacle as it is now. My Mom told stories about Christmas in Poland before WW-II, -- that the celebrations were always simple and no one even sang carols until Christmas Eve. And they certainly didn’t have Christmas movies on TV playing in October and November. Back in the day, Christmas was always a time of anticipation and excitement. Our traditional Polish Christmas Eve supper is called Wigilia, which means vigil or waiting for the birth of Jesus, and it was totally based on traditions and dishes that had been handed down for generations upon generations. It’s the most historical and anticipated meal of the year. 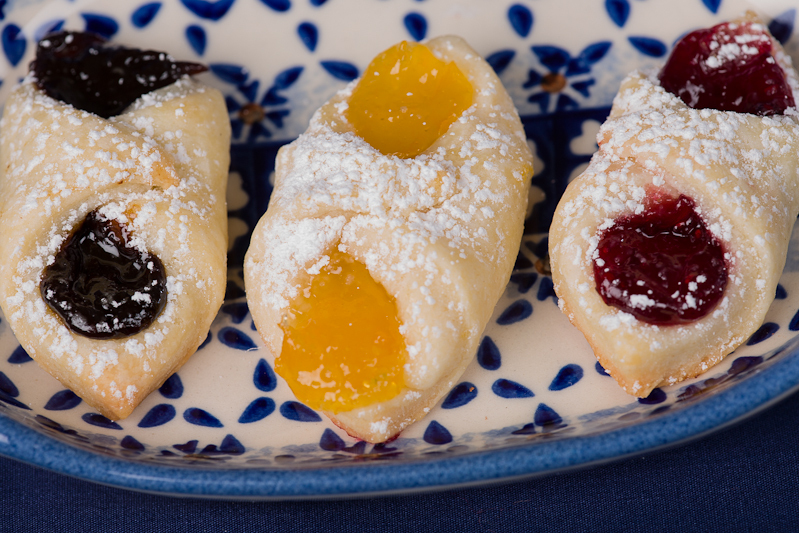 Generations of Polish Babcia’s would prepare food for weeks and weeks, just for this one special feast. Now things are a bit more modernized, but the traditions still live. The meal is meatless. It is customary to set an extra place at the table for the lonely traveler who may knock at the door. There are a few sprigs of pine branches on the table, from the holy manger. In the country villages of Poland, it might have been a thin layer of hay under the tablecloth. Always twelve dishes were served, symbolizing the twelve apostles . And poppy seeds were always a part of Christmas Eve supper as a symbol of peacefulness, and honey for sweetness. 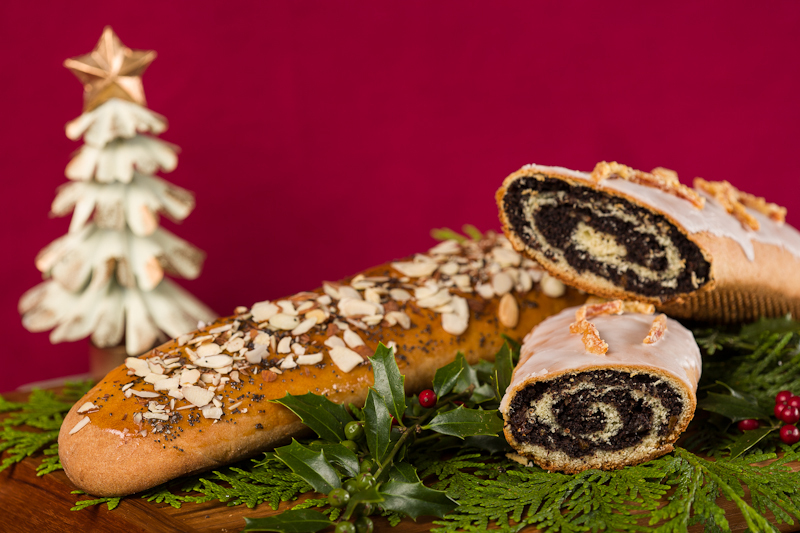 There is a magical delicacy of noodles with poppy seeds, honey and raisins, in our first book called: Kluski z Makiem. The feast should begin as soon as the first star is visible in the sky. When I was maybe 5 or 6, I remember running out on the porch and looking up, waiting for that first star to peek out, so we could get started with the sharing of the wafer – an important tradition that we still follow. I was always so hungry! 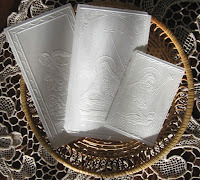 The white, almost translucent wafer is a symbol of love, friendship and forgiveness. It’s like a Communion wafer only rectangular like a small postcard. It is broken into bite size pieces and shared with everyone at the table along with wishes for a happy and healthy new year. 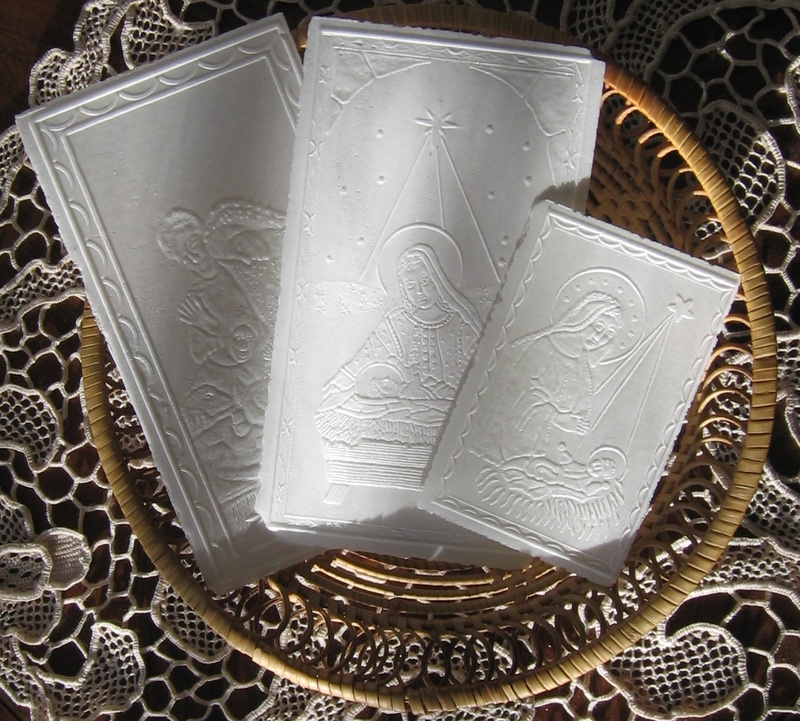 Peter’s Mom would always use a communion wafer blessed in Poland and mailed over. Now we get our wafers from a nearby Polish church or even through the internet. Our own menu is right out of our heritage cookbooks. We start with clear Barszcz - peppery, deep red beet broth, the rich color of a fine Cabarnet wine. This classic formal version doesn’t contain any vegetables and is served in our best fine china tea cups. 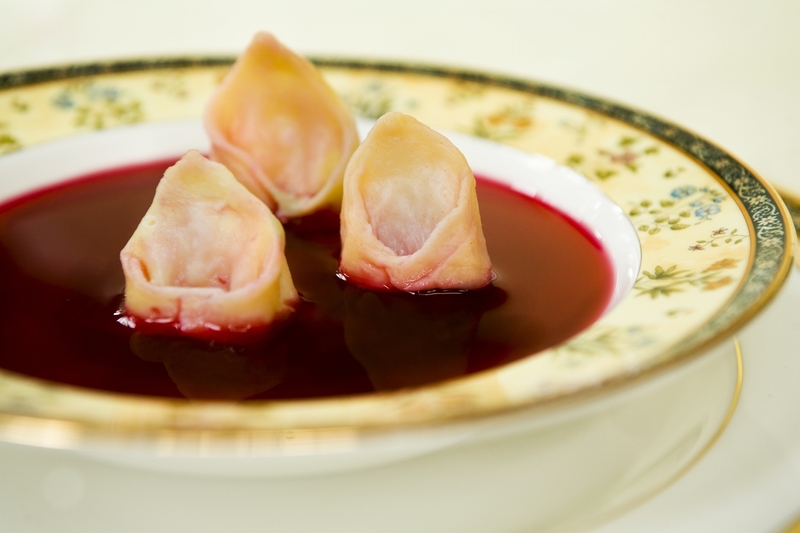 Sometimes it is served with little dumplings called "uszka." A second appetizer, always served with the Barszcz, are crepes stuffed with a savory mix of mushroom and sauerkraut, breaded and sautéed lightly in the pan, just to crisp up the outside. Our daughter and son-in-law would be perfectly happy if they were the only item on the menu and I always have to make extra. For our young granddaughter who hasn’t acquired the taste of sauerkraut yet, I just stuff her crepes with sweetened ricotta cheese and she loves it. Wigilia is meatless. Herring or carp is the traditional fish course but back in the 50’s in Canada, they were hard to find in the winter. My Mom would buy a very fresh salmon and actually freeze it whole in a block of ice. 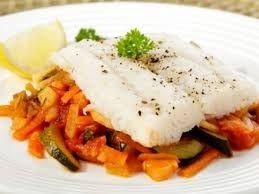 Today we serve haddock or flounder or cod or whatever white fish is fresh and available. Vegetables Polonaise, that is a colorful variety of fresh vegetables topped with a mix of breadcrumbs and butter, and some sort of potatoes round out the main course. Little potato pancakes, sometimes called Latkas, or in Polish - placki kartoflane, are absolutely heaven on your plate. 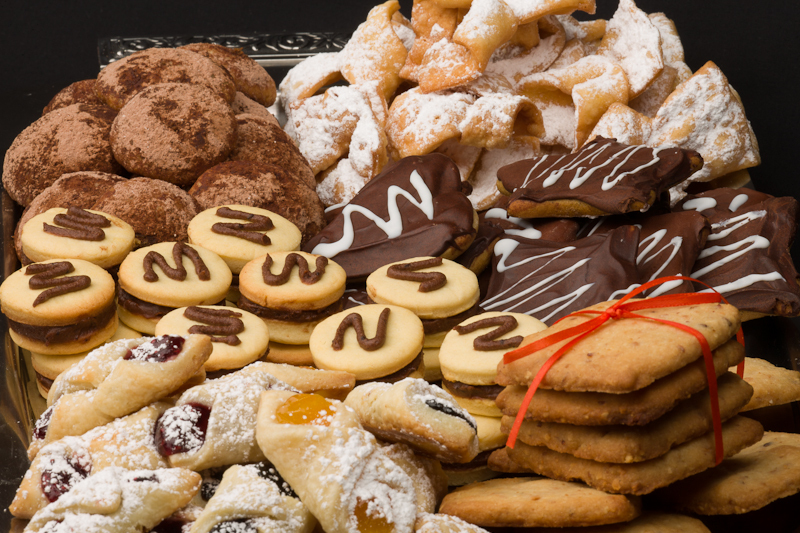 For dessert we always serve a variety of Polish baked goods as well as American Christmas cookies. The Polish Nut Roll and Poppy Seed Roll are always requirements. I usually make a dozen or so for sharing with friends. Peter loves trading sweets with our Greek neighbors – our Poppy Seed Rolls for their wonderful Baklava. And our Gingerbread Honey Cake – Piernik - which is so popular and easy to make. And our dessert table wouldn’t be complete without a stately Warsaw Fruit Cake which is not loaded down with cloyingly sweet candied fruit. Peter likes to pour a little Polish brandy over his slice, just for an added kick. 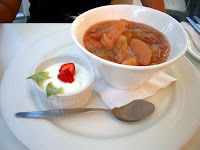 A compote of 7 or 8 dried fruits was also traditional for many years but I’m not a big fan. When I got older I’d kick up my Mom’s version with that same bottle of Polish brandy, while she wasn’t looking. Somehow I always got caught but seldom punished. After the feasting ended, and everyone let out their belts a few notches, Peter’s Mother always insisted that they sing Christmas carols together, before opening any gifts. We’d move to the real Christmas tree in the living room, sit uncomfortably on the floor and I’d stare at all the gifts under the tree. Dad would break out the old vinyl LP records - the old ones from Poland were so scratchy! It killed me because we had two languages to cover, my Mom couldn’t carry a tune and all I wanted to do was rip open wrapping paper. We usually enjoyed some more sweets with the gifts, and after cleaning up, we headed out to midnight mass where we saw all our friends. Christmas Day was the aftermath – supposedly a day of rest, of playing with new toys, and for going from house to house visiting friends and trying all the ladies’ baked goods. I’m told that the neighborhood competitions for the fanciest goodies were absolutely cutthroat. The tortes, the cookies, the baba’s, the fruitcake...they’re all preserved in our books for those who don’t have Grandma’s recipes. 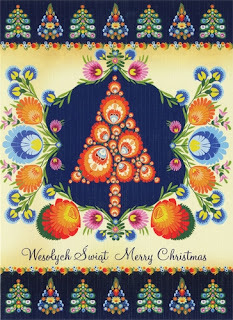 Laura and I wish you and yours, Wszystkiego Najlepszego na Boze Narodzenie, And Merry Christmas. And as always - Smacznego!